The Busch und Muller IQ Fly pedelec front light is designed, as the name suggests, to be used on bicycles with electric assistance. It has an excellent beam shape, and a bright 40 lux output. This light doesn't include its own power source, but it is extremely flexible in its power requirement, operating on any DC voltage between 6 and 42 V. This makes it compatible with almost any electric assist bicycle's power supply. 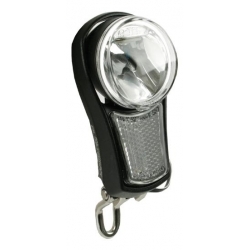 However, it is not only because of its suitability for pedelecs that we sell this light. It is also a good choice for use with any DC power supply. It doesn't matter whether you have 6 V, 12 V or other voltage of electrical system as almost any battery, NiMH or Lithium, can be used to power the light without any intermediate power supply. This light is not for use with a dynamo and will fail if used with a dynamo. We also sell a wide range of dynamo lighting.